In October 1990, less than one year after the revolution that toppled the long-time dictator Nicolae Ceaușescu, I decided to visit Romania. Until the December 1989 popular overthrow, I had only heard of Romania twice in my life: through volumes of The Bahá’í World, edited by Shoghi Effendi; and in high school, when one of my teachers showed us traditional blouses and painted handicrafts he brought back from a summer vacation in Romania. After the fiery movement that led to the violent overthrow of the regime, however, Romania was often in the news, serving in many reports as a beacon of a new age in which communism in the Eastern Bloc might be made to vanish completely, but also as a country whose citizens lived in the midst of much deprivation and suffering. Nine months before the overthrow of the government, a childhood friend of mine from Luxembourg had moved to the northern Romanian city of Cluj-Napoca to study and also help ensure a continued Bahá’í presence in that country. I was eager to know how she was faring under the harsh conditions reported in the news, and so, in the autumn of 1990, I flew to Bucharest. As I sat and read, I recalled the times that I sat in my father’s home office, pouring through the volumes of The Bahá’í World. Even then, I had been captivated by the photographs of the Queen of Romania and intrigued by her written appreciations of the Bahá’í Faith, a faith she had learned about from Martha L. Root, the American journalist who traveled the world sharing the Bahá’í teachings. During those impressionable years of my childhood, the beautiful face of Queen Marie’s face had been seared into my consciousness. Now, reading the biography, I took great pleasure in reacquainting myself with her and learning the story of her spiritual journey. As I read these snippets about Queen Marie’s acceptance of Bahá’u’lláh as the Manifestation for this day, I realized that no book had been written about the spiritual search of this important historical figure, a woman who was granddaughter to Queen Victoria and Czar Alexander II, sovereigns to whom Bahá’u’lláh had addressed two of his great Tablets to the rulers of the day. On my return to the Bahá’í World Centre, where I was serving at the time, I began to read everything I could find about Queen Marie, searching out any book that might contain any mention of her. Soon after, when I told some friends of my newfound interest, the same friends presented me with a gift from their library: a biography by Hannah Pakula, entitled The Last Romantic. It was the first story I had ever read about Queen Marie’s life from her birth as an English Princess to her death as Romania’s second Queen. In this book I found many references to Queen Marie’s diaries in the Romanian State Archives and a number of mentions of the Bahá’í Faith. I began wondering if there might be more information in those diaries about the Queen’s acceptance of the Bahá’í Faith, so the summer before I was to begin my graduate studies. I wrote to the Romanian State Archives and asked for permission to read the Queen’s papers, a request that was granted, and so I booked another ticket to Bucharest, this time to try my luck in the state archives. I was scheduled to leave the Bahá’í World Centre in June 1991 in advance of my return to school in the fall, but before I left Haifa, I attended a talk by Ruhiyyih Rabbani, who had just returned from a trip to Romania, a talk which, as it turned out, changed my life. Romania was just opening up to the Bahá’í Faith, she said, and its population was exceedingly receptive to all things spiritual, including the Bahá’í Faith. Now was the time for the Bahá’í youth to go to dedicate themselves to building the Bahá’í community in the former Eastern Bloc countries, especially Romania. I felt excited about the prospect of going to Romania for the summer in light of all she had said in her talk. A day later I received an invitation to have lunch with Ruhiyyih Rabbani at her home. Over the years of serving at the Bahá’í World Centre I had occasionally had the great bounty of such invitations, so I did not suspect that this lunch was going to change the course of my life. As always, a wonderful lunch was served, and then she said: “You know that Bahá’u’lláh advised us to go pioneering, to proclaim His Cause, and if we cannot do so, then we must appoint others to do so in our stead. I learned that you are going to Romania for the summer before going back to university, and I would like to offer to deputize you to spend one year in that very receptive country which I have just visited, and where I believe you could be very useful. Would you accept to do this on my behalf?” I was dumbfounded! How could I refuse such a request? My plans were being unexpectedly derailed, and little did I know at the time that this year would turn into a quarter of a century. What I did realize immediately was that devoting a year to research would give me a much better chance to come to understand Queen Marie than would devoting only a few months. So off I went to Bucharest, a city I had visited for a few weeks at the end of 1990, and which I had found very uninviting. Now I had a mission, which helped me overcome my concerns and fears. I spent the first few months getting accustomed to a very different way of life and also finding someone to teach me the language. I was encouraged by the fact that because it is a Latin language, those who know Italian, Spanish, and French generally find it quite easy to pick up Romanian, and, with the help of a teacher, I was able to communicate in the language within six months. The opportunity to live with a family who spoke no English, served as the immersion experience that helped me continue to improve my Romanian language skills, and to this family I am forever indebted. At first living in Romania presented me with many challenges, but I persisted; in one of her notes of encouragement Ruhiyyih Rabbani told me that it was her wish that I bury my bones in that country. If she viewed service in Romania as that important, I thought to myself, I should stay as long as I possibly can. In the end, one year turned into 25. The whirlwind of community-building and institutional development in the early years of the establishment of the Bahá’í Faith in Romania required a great deal of assistance from more experienced Bahá’ís, and I was honored to be able to offer some of the skills I acquired at the Bahá’í World Centre to this important work. But there was little time left over for doing research at the State Archives. Still, I persisted, and as soon as I learned to speak Romanian sufficiently well, I became a regular researcher there. The reading room had a high ceiling, as did all the rooms in that building. The communist practice of surveillance persisted, so I had to sign in and out of the building, and I was not allowed to bring any belongings into the reading room except pens, pencils and a notebook. All of the papers of the royal family were stored in the state archives and indexed in very large ledgers. One of my difficulties was that the index was mostly in Romanian, and while I could converse increasingly well, I found it challenging to read in Romanian and also to know what items might contain information relevant to my search. As a result, I devised a strategy to narrow the field a little by requesting documents relating to the period I was researching, namely 1926 to 1938, unless it was clear that an item was not related to my quest. In order to be allowed to see any document, I had to fill out two different forms in triplicate, without carbon paper. The two custodians who manned the help desk invariably found fault with whatever I had written, making it necessary for me to fill out these forms multiple times. This happened over and over again during the course of my research, but usually, the requested binders, containing the original materials, would be presented on my subsequent visit. As my research progressed, I became increasingly absorbed with my search through the many papers related to Queen Marie of Romania, and also increasingly familiar with this interesting royal personage, much admired in Romania, in Europe, and in the United States. Then one day, as I was flipping through one of the binders, I came across a letter addressed to Queen Marie. The handwriting was very familiar. I excitedly turned the page to verify the signature I hoped would confirm the accuracy of my recollection of that unmistakable penmanship. There it was, a letter dated July 28th, 1926 letter, and signed Shoghi. Here was the first letter addressed by the Guardian of the Bahá’í Faith to Her Majesty, Queen Marie of Romania. As I found out some time later, the Archives at the Bahá’í World Centre held only a draft version of that first letter. Until I presented a copy of the original letter to the Universal House of Justice, it was unclear what this first communication contained. What a thrill to have before me an original letter of Shoghi Effendi to Queen Marie of Romania, in response to her public acknowledgement of the Bahá’í Faith, published in the Toronto Daily Star on 4 May 1926. As Ruhiyyih Rabbani wrote in her biography of Shoghi Effendi, for the Guardian at that time, Queen Marie’s appreciation was like “some rain from heaven, in the form of good news” that served to relieve the intensity of his suffering and revive his spirits. The conditions under which I worked in the state archives were very trying — it was very cold in winter and very hot in summer, the old East German microfiche readers had to be turned off every 20 minutes to let the bulb cool down as these were hard to replace, requests for materials had to be prepared, and every piece of information had to be copied by hand since I could not be sure that photocopies would be provided. However, the original letter written by Shoghi Effendi, found quite early on in my research, made the whole project worthwhile. In the end, after weeks of worry that materials I had requested, which were mostly related to the Bahá’í Faith, would not be given to me, printed versions of documents, were presented to me by the reference librarians, though none of the photographs, since, at the time, they had no way to copy these. Once I had worked my way, quite methodically, through all the materials in the archives, I realized that there was a story to be told, and decided that I would do everything in my power to tell it. I organized my information chronologically — from 1926, when Queen Marie first heard of the Bahá’í Faith from Martha Root, to 1938, when the Queen passed away — and I decided to prepare a chapter for each of the roughly 12 years that the queen had known about the Bahá’í Faith. I would need to connect these 12 years as well and put them into context. As I reflected on the task before me, it seemed to me that it was important to provide readers with biographical sketches of both Martha Root and Queen Marie, so I added this task to my outline for the book. I was fascinated by the life of Martha Root, who taught Queen Marie about the Bahá’í Faith, a woman Shoghi Effendi described as “that unique and great-hearted apostle of Bahá’u’lláh” and “the truest and best example to every labourer in the Divine Vineyard.” If it had not been for Martha Root, I would not have a story to tell. What became clear to me as I talked to different people about the project was that many wondered if Queen Marie was really a Bahá’í. I myself had never questioned this fact in any way, and even after all my research, I did not once waver in my belief that this Queen had, indeed, accepted Bahá’u’lláh as the Manifestation of God for this day. It was all so clear to me: this brave Queen, in spite of pressures from many around her, chose to publicly declare her wholehearted acceptance of Bahá’u’lláh and to encourage others to carry out an independent investigation of this truth. I believe that so much of the work I did in completing this project was somehow inspired. Often it felt as if Queen Marie and Martha Root were spurring me on to tell this all-important story of the first reigning monarch to become a follower of God’s latest messenger to humanity. My book about Queen Marie, Her Eternal Crown: Queen Marie of Romania and the Bahá’í Faith, was published by George Ronald Publisher in Oxford in 2000. As any published author will know, it was an incredible experience to hold in my hand the first copy of a labor of love that took me nine years to complete. And still today, I often reflect on what a profound honor it was to become acquainted with the protagonists in this moving story and to uncover all the details that make this chapter in the history of the Bahá’í Faith so important and so compelling. Bio: Della Marcus is a writer who currently lives in the United States. 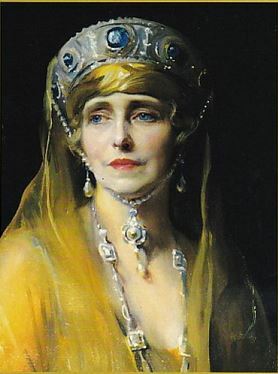 She is the author of two books about Queen Marie’s discovery of the Bahá’í Faith: Queen Marie of Romania: Her Eternal Crown and Regina Maria: Un Instrument în Mâinile Divinităti [Queen Marie: An Instrument in Greater Hands]. Della is of American descent, was raised in Luxembourg, lived for some years in Israel and also for an extended period of time in Romania, not long after the fall of communism.